Depending on the venue, paintball games are played on either indoor or outdoor fields of varying size. A game field is scattered with natural or artificial terrain, which players use for strategic play. Check out the paintball games providers in Singapore. Crossfire Paintball is Singapore’s most innovative paintball venue. Unlike other venues that are normally played on an open field with small obstacles placed in certain locations, Crossfire is played on a specially sculptured field. Check out the challenging obstacles such as the maze, fortress and castle. Players will have a fun time running and hiding among these structures. And if you are aspiring to be a marksman, pit your shooting skills against your friends and colleagues using our ‘Bravo-1’ paintguns! Crossfire paintguns are modelled after real M-16 rifles to give you that realistic and unique experience. The paintballs are loaded via the hopper and powered by carbon dioxide. Don’t worry about staining your clothes. The paintballs are fully biodegradable, non-toxic and water-soluble. Come play at Crossfire Paintball. Hear the hissing of the paintballs flying by. Feel the sting of the paintball splatter on you. It will be the most fun you will ever experience! A quick 30-minute drive from the city, the PIE and turn off at exit no. 40 or AYE exit no. 20. Take SBS Bus no. 193 or 182 from Boon Lay MRT Station. $25.00 per player for a 90 mins session. $40.00 per player for a 120 mins session. 250 pellets is required to be purchased. Red Dynasty Paintball Park is the newest and largest paintball arena in Singapore which caters to all your paintball needs. With an arena as big as a soccer field, the Red Dynasty Paintball Park accommodates a 20m shooting gallery, 2 scenario based fields and 1 standard size speedball field. Located in the north of Singapore in Bottle Tree Park, Red Dynasty Paintball Park is easily accessible by all transportation means. Offering the most affordable and attractive paintball package, we cater to people of all ages* or organization with large group size. Red Dynasty Paintball Park offers the most reliable paintball equipment. Our equipment are carefully maintained on a rigorous schedule and cleaned to provide the most comfortable experience for all. Our facilitators are competent in the delivery of team building activities and will give complete attention to your learning needs. 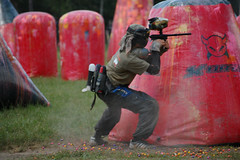 Red Dynasty Paintball Park is the only paintball arena in Singapore that offer varieties of paintball game scenarios. To ensure that customers follow a progressive route of competencies in paintball, customers learn to handle paintball markers the correct way by having a “feel” of shooting one at the shooting gallery, progressive learning then proceeds by playing in a novice field, a 20 men scenario field and lastly a speedball tournament field with an impressive set up of more than 35 inflatable bunkers. Red Dynasty is the only paintball park in Singapore to offer speedball bunkers for players who are interested to play at a competitive level. With facilities catering to both recreational and competition paintball players, what are you waiting for? Come visit us today! “One Shot, One Kill” Bring out the James Bond in you! Try out the designed scenario games and pit your skills against your opponents. The game marshals will guide you along in these role playing games which enhances team camaraderie and communication. Suitable for groups who are keen to do a little running and dodging. Estimated game duration is about 1 hour which includes safety briefing. One man with one mission: Destroy the opposition and survive! With 250 paintballs assigned to you, you are fearless and dangerous. Immerse in a fun day of shooting, hiding and capturing the flag! As the most popular package, this will guarantee you with a full paintball experience. Suitable for team building games amongst friends, colleagues and families. Special events such as birthday parties, hen and stag parties, carnivals, companies retreats, outdoor adventure activities, tournaments and more…Estimated game duration is about 2 hours which includes safety briefing. T.A.G (Tactical Action Games) Paintball has brought the electrifying sport of paintball to Singapore since 1999. T.A.G Paintball is currently located at Turf City (Bukit Timah). T.A.G prides the very latest in paintball hardware technology. Every one of paint guns is rigorously maintained and checked to provide ultimate performance and reliability in combat situations. With free gas refills your weapon will always be firing to the limit and will not let you down (Source: TAG website). Share with us below your experience playing paintball games in Singapore! Southeast Asian (SEA) Games 2009 is coming!